I have an addiction to buying art supplies - buying, not necessarily using. I have the best of intentions when making a new purchase. I get a project in mind and while committing to purchasing whatever it is for whatever I plan to use it for, I promise myself that this is going to happen. Like I said, the best of intentions. Sometimes I start a project and realize it is going to take much too long and give up before I finish. Other times I realize the fantastic project I had in mind is beyond my skill level and that I need to start out out simpler. Often it is just that I simply take on too big of a project and realize that I have to start smaller and build up to something bigger. In the very worst of cases, I start to get a compulsion to have something. I start obsessing and really feel like I HAVE to have whatever it is. I started to feel guilty of spending so much on art supplies. Even though I am a bargain shopper art supplies are costly. To reduce costs I slowly started buying "used" art supplies. Often these are new or like new. I buy a good number of my supplies second hand now - 1) because the cost is reduced, 2) because I get more bang for my buck, but also 3) because I hate to see waste. I am passionate about recycling, upcycling, reusing, etc. The consumerism in America is really horrendous - it is excessive, especially compared to other countries. As much as I am against this in theory, having a compulsion to buy something does not help so I feel less guilty when buying second hand. I am saving something from being dumped in a landfill and hopefully putting something to use that would have been otherwise wasted. Where do get my art supplies? New supplies I buy from both small, independent stores and large, big box retailers - I will list my favorites in a separate post. For second hand supplies I mainly buy at garage and yard sales, ebay, and other online retailers but my favorite place is the Scrap Exchange, a re-use center in Durham. Some of the pricing can be inconsistent but I generally get a great deal on markers, pens, pencils and inks. I also my vintage papers, old office supplies, storage containers, etc. Whatever the case I have a sh*t-ton of art supplies. I committed this year to using what I have, minimizing what I buy (especially if new) AND repairing or making my own art supplies. Lately I have made my own ink pad refresher, blending pen refills, DIY gelli plate and modeling paste (new post to follow soon). I have revived dried out markers (water and alcohol based) and invested in ink pads AND ink pad refills. In addition to re-inking old ink pads the re-inkers are pretty versatile - these can be used for water coloring, dying different materials, etc. I'll be posting and sharing how-to's and such. I look forward to sharing all of these with you so please visit often and feel free to share your own tips, tricks and hacks. For my first post please see colored modeling paste hack . Modeling paste is one of the pricier art supplies. I have a sampler kit that I love but the full size products can be very expensive. I found a few recipes online to make your own modeling paste. When mixing the modeling paste I ran out of white craft paint so substituted with gesso. I wanted the mixture a little thicker also so kept experimenting until it was the consistency that I desired. After I finished the first batch I decided to try mixing with stamp dye refill. I ended up making two batches but kept a larger jar of the white modeling pasted. These film canisters were the perfect size to stir and store the colored samples. - Stir until fully blended. It helps to keep scraping the sides to get an even mixture. Since the container is clear it is easy to see if you need to continue scraping and stirring. - Repeat adding color and stirring until you are happy with the results. I kept adding a few drops until I got the color I wanted. I found that some colors (yellow and blue for example) took much less dye where others I had to add quite a bit more to get the right amount of color saturation. Once finished I labeled each container. I also made a small sample using dye and Pearl Ex powdered pigment. The iridescent finish is very subtle and I unfortunately had to use quite a bit of the pigment. I think it would be more cost effective to use a white paste, then apply pearl-ex as normal once the modeling paste was dry. - Mixture was a little thinner than commercial modeling paste. I found that it was easier to apply by dabbing vs. spreading it. - The homemade paste worked better on the stencil designs that were not as fine or intricate. The larger the area to cover, the better. - Drying time was longer. Please note that the finish was matte. If you want a glossy or translucent finish I would suggest coating with a glaze once finished. Using a glossy paint and less powder may also give it less of a matte finish. After a long sabbatical I have slowly decided to blog again. Why the long break? We simply became so busy in our day to day lives that I really no longer had the time that I once did. The children - now young adults - had become so busy with school, sports, social lives, etc. I also have several interests (reading, art, working out, etc.) so really had to prioritize what I wanted do with the limited time I had (and still have). I had also simply lost an interest in blogging. I really felt like I wanted to be sharing information about things that I am passionate about so although I may still do product reviews and host giveaways, it will be more tailored to where I am at in my life now. The content will be more closely mirrored to my current hobbies, interests and day to day experiences. I hope to slightly reformat the blog but realize how much I have forgotten - my tech skills are definitely a little rusty. Unfortunately I had to delete most of the former content from my blog - one of the links I had posted for a partner was against Google's TOS. Unfortunately they would not tell me which blog post so in frustration I eventually deleted most of them. I tried re-posting all of the content but it was simply too time consuming and then I honestly just did not even see the point of doing so. I hope that my former readers will still choose to re-visit Momanthology. I have missed your visits and your comments and have also missed liaising with other bloggers and PR partners. It will be great to hear from you again and rejoin the land of the living - cyber-living anyways! One of my friends at work built a BEAUTIFUL Cabin in Colorado. He generously offered to let me stay. I did not plan to take him up on his very kind offer but somehow did end up doing exactly just that! Every year my old college roommates and I try to get together. For this trip 2 of my college friends (La and Susan) and I met for a phenomenal girl's weekend! Samantha, Carrie and Jessica were not able to attend). Arrive in Denver and meet the girls at the car rental lot. We began the trip with a stop to Chris K.'s house to pick up the key and get general cabin instructions. Afterward we stopped at Walgreens and then Walmart due to a minor but urgent medical situation as a result of the change in climate and altitude. After that was squared away, we finally started on the trip to Fairplay, CO.
Once we arrived in Fairplay we stopped at Prather's, the one grocery store in town, and loaded up. Then we stopped at the liquor store to purchase beer and wine. Although there was only one Grocery Store, it did seem like there were a couple of Liquor stores. We went to the one that had the sign literally upside down (very funny - I could totally appreciate the humor in that). Even though the sign was upside down, people had no problem finding it. The Liquor Store was quite the hot spot at 5pm on a Friday afternoon..... For a small town the liquor store was seeing more than it's fair share of action. After we were fully stocked up on groceries and alcohol, we began the trip up to the cabin. This involved a drive through town, turning onto country road and driving down until it turned into a dirt road. It then took a lengthy trip up a mountain. It was a very steep drive with many sharp turns in a very remote area.. Needless to say we made sure that we had everything we needed before leaving the cabin or before going home. For our first adventure we headed to Breckenridge which was a couple of hours away. Our first stop in Breckenridge (just outside of town) was at Snow Caps Snow Dogs. The $65 fee for the Cart Tour covers a tour of the facility, meeting various dogs, learning about the general area and the actual facility as well as learning about the different breeds of dogs, how the dogs are named, how they interact with one another, how they are trained, how the dogs are selected and how dogs who retire are adopted out. Quite a bit of information! During the tour we were able to interact with the dogs which was fun. My oldest daughter actually have an Alaskan Husky - she now lives with us so it was helpful to learn about the breed. Once the facility tour was complete we were ready for the cart ride During the winter when there is a good covering of snow on the ground the dog team will actually pull visitors on a sled. Since it was autumn however, we sat in a golf cart instead of in a sled. The dog team was hooked up to the cart and pulled us just like they would a sled. Our tour guide Ike explained that the dogs actually do all the work and he generally only uses the brakes to assist (not the gas). The tour was fun and the dogs were VERY excited. After the visit to Snow Caps we headed back into Breckenridge where we shopped for a while Afterward we headed to Dillon Lake / Frisco, CO. One interesting thing we learned at Dillon Lake was about Zebra Mussel prevention efforts; Zebra Mussels are an aquatic, invasive species that can cause significant damage to water quality and property. (You can read more HERE). After Dillon Lake we stopped to eat and then headed back to Fairplay. We made sure to stop at the Continental Divide on the way home. We hit it just around sunset so we were thankful that we were able to get photos. This was the biggie.....we had a FULL day. We started out with a trip to Pike's Peak - La said that she has wanted to visit Pike's Peak ever since grammar school when she learned about it. I had never heard about it and no idea what Pike's Peak was. Now I know. On the way to Pike's Peak we made a pit stop at Wilkerson Pass - it was a little park / rest stop with a spectacular view of the valley. I was fascinated with the Aspen trees when we were in CO. The leaves were just starting to turn and I was able to get some beautiful photos. We only stopped for a bit and hit the road again to visit Pike's Peak. We had planned to take the train up to the top of the mountain but the tickets were sold out. It was then that we made the very brave decision to drive up to the summit. Let's just say this... It was scary on the way up and it was even more frightening on the way down. I was not allowed to drive however as that apparently would not have just been scary or frightening, but terrifying. I did not argue as I had absolutely no desire to drive up OR down the mountain. Instead Susan drove up Pike's Peak and La drove down. On the way up there were various pit stops - one apparently that Big Foot frequents. We tried to act as frightened as we could for the cameras. I will not be winning any academy awards any time soon. Big Foot at Pike's Peak - we found him! After goofing off with Big Foot we hit the trail again. It was a twisty, turvy, STEEP drive to the top. When we made it up the entire way I felt pretty lightheaded. As I watched people veer to the edge of the cliffs on either side I sat back and tried not to judge too harshly. While Susan and La walked around I stayed back and collected rocks for my rock tumber - 1) because I was dizzy from the altitude and car trip up AND 2) because I am a nerd. This was my favorite park that we visited. See the nature center photo of the interactive display followed by my own personal photos of the park (and of me at the park!). SO beautiful. After touring the cave dwellings we visited the gift shop and I picked up a few items for my children. We were pretty tired after such a full day and headed home. This was the night of the eclipse and subsequent blood moon so we had to pull over the side of the road a couple of times and watch. I had NEVER seen an eclipse before and always wanted too so I was very appreciative that I finally had the opportunity to do so. The sky was relatively clear and we were able to see most of the eclipse. An older man who drove up next to us had binoculars which he let us use to get a closer look. I tried to get a photo but could not capture a proper picture using my iphone. After the full eclipse we got back into the car to finish our journey home. By the time we reached Fairplay most of the restaurants were closed except for 1! (Asian Fusion). We made it in just before closing so we took our food to go, had a beer while we waited for the food to be prepared and headed back to the cabin once we had our order in hand. Well, we HAD a full day planned but a car accident that stopped traffic for hours both ways ended all of that. We planned on visiting the South Park City Museum and ghost town but we were distracted by a bead store (WONDERFUL!) and art shop next door. We ended up shopping in the morning and then headed to Buena Vista where we encountered the accident. After waiting an hour we turned around and spent the rest of the day driving around Pike National looking for wildlife. Susan was determined to see wildlife - especially a moose - but all we ended up seeing was a raccoon and a mule deer. All this within 1 - 2 miles of the cabin. We should have never left LOL! Afterward we headed home and La made dinner. Afterward we drank wine / beer and played cards until the wee hours of the morning. The morning started with a mad rush to clean the cabin and pack the car. We then drove back to Broomfield to drop off the keys, repeatedly thank my co-worker and then head back to Denver to the airport. Between dropping off the keys and heading to the airport we stopped for a quick lunch at Azitra - one of my favorite restaurants in Raleigh . (I actually meet my old co-workers there when we are able to coordinate schedules). It was so ironic that Azitra also had a location in Colorado exactly where we decided to stop - especially as they only have a small number of locations (Raleigh, NC, Broomfield CO and somewhere in VA). Overall it was a fabulous trip - I already miss my girlfriends and we are already planning our next adventure! I remember as a child I had a coloring book that I loved (late 70's) consisting of geometric patterns. It was part of a small series and at the time there was not really anything else like it. Ironically the same books are still sold today but there are now SO many other different options for what is more recently referred to as "Adult Coloring". There are books in the geometric patterns that I still love, but also books with designs in or inspired by mehndi, mandalas, art deco, art noveau, fantasy, wildlife, nature, butterflies, fairies, fashion, flowers, etc. Whatever strikes your fancy really. Initially I did start out coloring with pencil and found that while it was very helpful for practicing shading techniques, it was also relaxing. Recently I was talking at work about how I had tried adult coloring and another co-worker shared that she also had taken up adult coloring but with Sharpies, not pencil. I enjoyed the coloring but not the time involved when using pencil so decided to give markers a try. I now prefer using markers but will probably continue to use both colored pencil and marker depending on how intricate the design is and what I am trying to accomplish. If you are considering purchasing an adult coloring book look no further - these books are great. - a large number of designs - 46 images in each book! One thing I found that was funny (in a good way). Take these out when around kids or a few friends. You will be surprised how many people want to stop what they are doing and start coloring - seriously! People love to color! - invest in some good cardstock - if using permanent markers make sure to put a piece of cardstock underneath to absorb excess ink so you do not ruin the page underneath OR the surface you are coloring on if you rip the page out to color on. You can see above how the color can tend to bleed through. - invest in a good variety of pens / pencils. I discovered that even with the most careful hand, the thicker permanent markers will not do well with the fine lines. I actually purchased a set of fine line markers from the dollar store and these are working just fine. - If you accidentally color outside a line or put the wrong color in a certain section do not get worked up about it - Chances are that the mistake is not very noticeable. By the time you finish coloring you yourself will probably not even notice! - I have a variety of markers (a TON actually). For permanent marker I find that Sharpies offer a lot of color options but are not acid free. Bic Permanent markers are acid free so I use these in my mixed media artwork as well as for coloring. If you are looking for a little glitz, consider glitter markers or gel pens. Some that I have are Zig's Wink of Stella (LOVE these), Fiskars Gel pen set and Sakura's gelly-roll pens in Stardust. If you opt for colored pencils there are a ton of options. I prefer the softer, waxier pencils like Prismacolor or Crayola - I find these offer strong color saturation and easier to blend / pull colors into one another but on the negative side it is more difficult to get the fine detail without constant resharpening. If you are OK with less color saturation but more fine detail a harder lead may be preferable. A good example of this is Sargent-Art - these pencils are too hard for my taste but I have my set to my 14 yo daughter and she absolutely loves them. 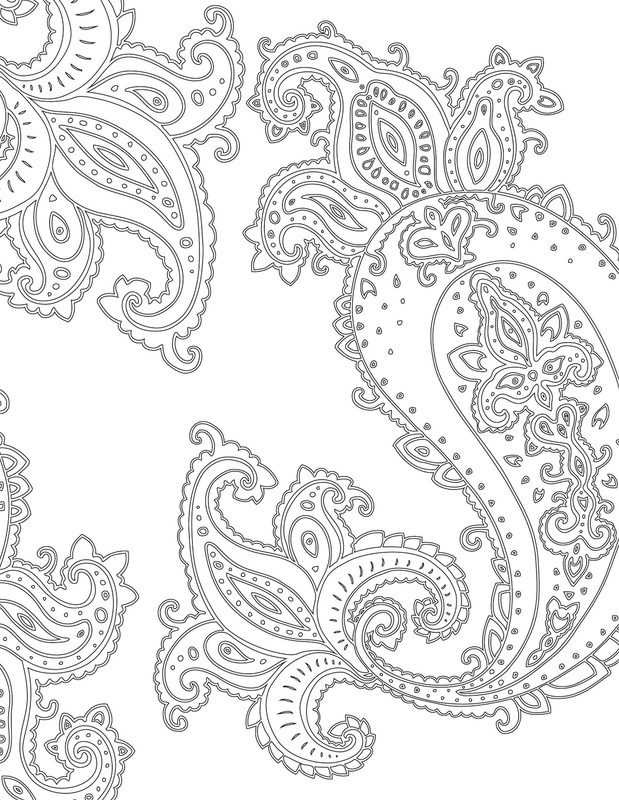 If you find that you love adult coloring, find what medium works best for you!. Skyhorse presents 12 new titles to help you achieve mindful meditation through creation. Since 2013, coloring books targeted to adults have topped bestselling charts, selling more than 1.5 million copies in over twenty-two languages. Five of the top thirty titles on Amazon’s bestseller list are coloring books aimed at adults. Skyhorse Publishing’s first four adult coloring books featuring the paisley and mandala motifs have already sold out four printings, selling at bookstores like Barnes & Noble, on Amazon, and at specialty stores like Michael’s Arts & Crafts and A. C. Moore. Not unlike the adult summer camps and wine-and-painting parties that have surged in popularity over the last couple of years, coloring is a nostalgic activity that allows people to unplug and fend off the stresses of daily life. With our screen-weary culture, it’s no surprise that adult coloring events have begun to pop up across the US attracting “colorists” to unplug and unwind in social settings. Unlike most coloring books, Skyhorse’s books have sixteen pages of full color for inspiration along with perforated pages, allowing budding artists to photocopy, gift, or display their beautiful creations! This twelve-book series features vibrant illustrations and detailed introductions highlighting the histories of themotifs, including paisley, mandala, art nouveau, zen, mehndi and whimsical designs. Whether you’re interested in the mindfulness movement, in therapy for seniors, or in a business trend that’s dominating the book business, adult coloring books are hot! Thanks to Skyhorse publishing, here is a download available for free to Momanthology readers! Disclosure: I received two books for review purposes. I did nt receive any monetary compensation. All opinions expressed are my own.